Reefer freight markets are transitioning, with activity slowing down in Southern Florida and the demand for trucks picking up in California and Texas. There was also a big jump in the number of reefer loads available last week in Nogales, AZ, which is an entry point for a lot of produce from Mexico. Darker-colored states have higher load-to-truck ratios, meaning that there's less competition for reefer loads in those states. Atlanta is number 1 for reefer load posts on DAT TruckersEdge, and both outbound volumes and rates were better there last week. Part of that could be onion shipments, plus whatever peaches survived the late-winter/early-spring freeze. 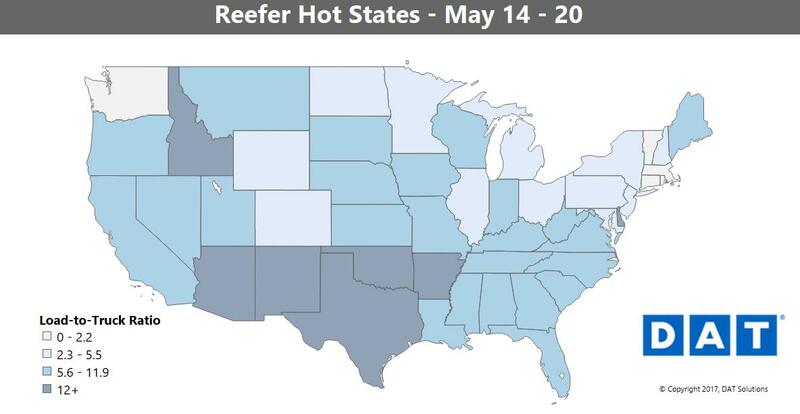 Illinois is still pale in the Hot States Map up above, but Chicago reefer volumes were up 12% last week. If the extra demand is sustained, that could also give vans a much-needed boost. Busy reefers won't compete for van freight. Lakeland in central Florida is still number 2 for reefer load posts, but since volumes have tumbled in Miami, there are more trucks deadheading north to find loads. Rates are way down out of both markets, as a result. Look for a short haul to Jacksonville, then out. Harvests look like their poised for a strong comeback in California. Volumes were up out of Sacramento in the northern part of the state, and Ontario in the south, while load counts have surged out of Fresno this week. Cherries will also start shipping out of the Northwest in early June, and volumes are expected to be strong deep into the summer. Atlanta to Philly rates were up ▲11¢ to $2.68/mile. See what other truckers got paid on the lanes you run by signing up for TruckersEdge Enhanced. You'll see the average prices paid on more than 65,000 lanes, based on real transactions between brokers and carriers. To add rates to your TruckersEdge subscription, call 866.487.8253. Do Brokers See a Different Rate? Follow us on your favorite networks for news and updates from DAT Solutions! © 2019 DAT Solutions, LLC. All rights reserved. All trademarks are the property of their respective owners.